My trip to Italy was fantastic! Since I have already seen the sights in Venice (twice) and a major one in Verona, I did not embark on an exhausting tour, shuffling from sight to sight to sight. This was my chance to simply enjoy my beloved Italy. To wander. …and, yes, to go shopping! My travel partner J shared my interest in acting as a local might, instead of falling into the tourist traps, and thus was completely game to my plan. 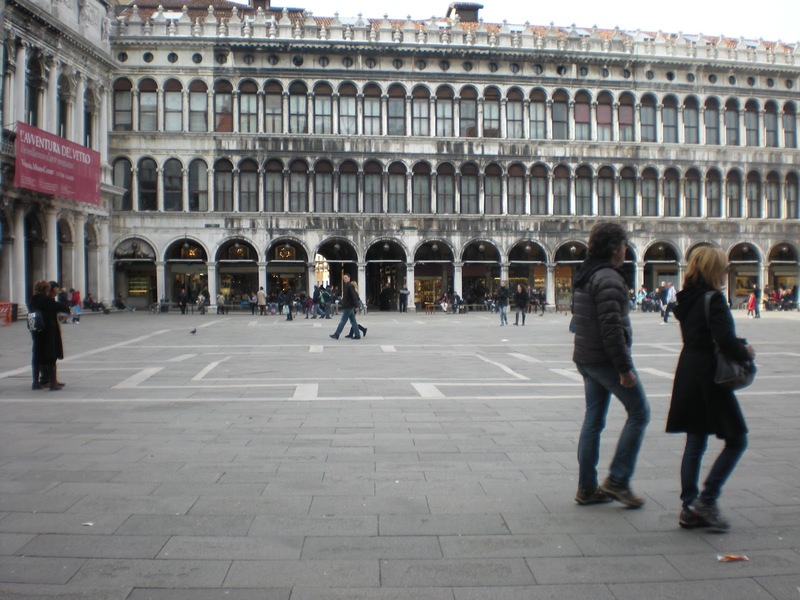 In fact, it was his idea to; in order to seem less like tourists, refer to Rick Steves’ tips plucked from his Venice 2011 guidebook as simply advice from our friend Rick! After arriving in Malpensa, the airport outside Milan, I promptly had my first caffe, which is a shot of espresso served in a little white cup on a little white saucer. Next, I hopped on a bus for an hour-long ride directly to Milano Centrale (train station) where I planned to meet J. I took him immediately to the station bar (they serve food, not alcohol in Italy) to introduce him to caffe and cornetto (croissant) or brioche (another pastry). I explained the various rules of coffee-drinking in Italy, like… do not order a cappuccino after 11 AM and never have it after eating tomatoes! The two of us took a train to Verona. From the train station, a bus brought us to Piazza Bra, and then we strolled down its most famous street for shopping, Via Mazzini, which was pedestrian-only. The sweet front desk associate at Hotel Aurora checked us in. The room was nice and what made it nicer was the view of the street and portico filled with artisans’ stands. If you leaned out the shuttered window and looked towards your left, you could see the piazza. For lunch, we dined outdoors on Piazza Erbe, a beautiful piazza lined with buildings from the medieval and Renaissance periods with stands selling produce and souvenirs in the middle drawing the attention of the locals for our people-watching pleasure. We ordered the local wine called Valpolicella Superiore, which I really liked. 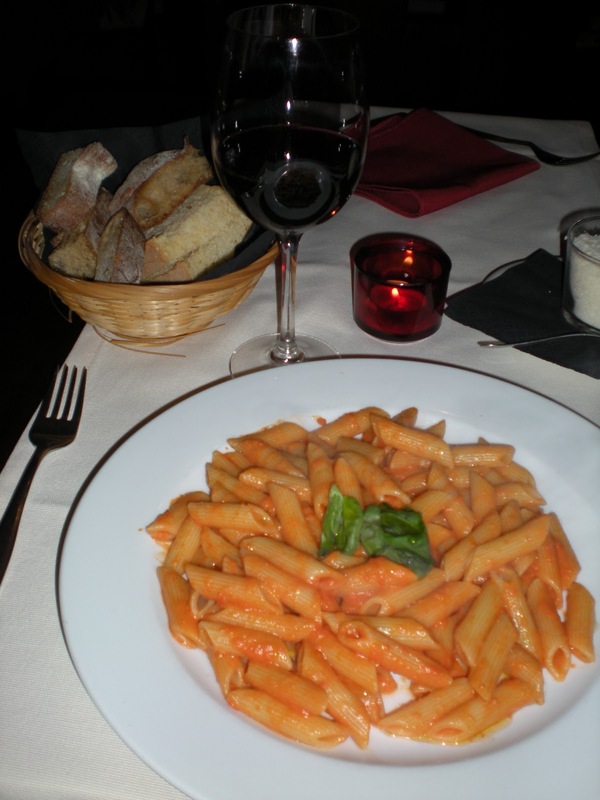 I ordered a vegetarian pasta, penne with lots of different vegetables, which was meraviglioso (wonderful)! J ordered lasagna which was so creamy and delicious. Following that fantastic experience, we hit Juliet’s balcony in a courtyard which was packed with people, mostly Asian tour groups. We wandered around Verona and even stumbled upon the gelato place we later found highly regarded in our guidebook, by, ahem, Rick. 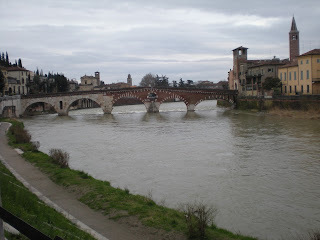 We saw the bridge rebuilt with its original white stones of ancient Roman times. Since I do not sleep on planes, we went back to the hotel to rest before dinner. Italians eat late and we wanted to act like locals, so around 8:30, we chose a restaurant and we were lucky they could accommodate us into their small dining room without a reservation. J asked the couple seated beside us for an antipasti recommendation. The Italian guy answered with “culatello” which was delicious. It kinda reminded me of prosciutto crudo but not him, so I kept my mouth shut! It was thinly sliced meat served on a cutting board. J was very adventurous and ordered horse for his meal, which was served shredded like pulled pork. I tried it and it was not bad. With its strong taste, I am not sure I would eat a whole plate of it however. My dinner won the contest for the best looking meal. I had lamb chops with a side of yellow grilled potatoes. We tried the house red wine and I did not care for it as it was fizzy. To go along with wine, one usually orders bottled mineral water, either still or sparkling (frizzante in Italian which J loved). Bread was served as well. There were rolls and breadsticks that were like pastry on the inside. We had our second gelato late, while just walking around. It turns out that March 17th was a national holiday, not St. Patrick’s Day, but the 150th anniversary of the Italian union (1861-2011). This event will probably not reoccur, as in the 151st anniversary will go by unmarked by festivities. The Italians decided to celebrate this only a couple of weeks before. We had no idea. Wondering why all the shops did not reopen after siesta, I asked the Italian guy seated next to us at dinner if it was a holiday and he replied it was the 100th anniversary of the union. Since he got the number wrong, it really didn’t seem like a big deal. It concerned us just a bit after he said it was planned for a Thursday so the Italians could take a four day weekend. Was everything going to be closed for the rest of my trip? His date was an Austrian girl. The four of us had a couple of nice little conversations. She told J where to go when visiting Vienna as well as approving his plans for Munich. The next day we left the hotel breakfast buffet behind and stepped into a nearby bar. There, I had my first cappuccino (also the most delicious of my trip) and also a cornetto. Squisito (literally “exquisite” but meaning “delicious”)! J and I shopped the stands of Piazza Erbe and headed out. On the way we stopped at a supermarket so I could buy a small juice pouch of blood orange juice (which is more sweet and smooth than orange juice. It’s almost like fruit punch) and at the Arena, an amazing amphitheater constructed in Roman times still in use today for operas and other performances. In fact, workers were building a stage at the time of our visit. Back at the train station, we had to wait a couple of hours for our train to Venice so we lunched on pizza margherita. We had our second caffeine of the day—un caffe per me and a caffe macchiato for J, which we learned was an espresso with a bit of milk. J also bought a watch for his expanding collection. 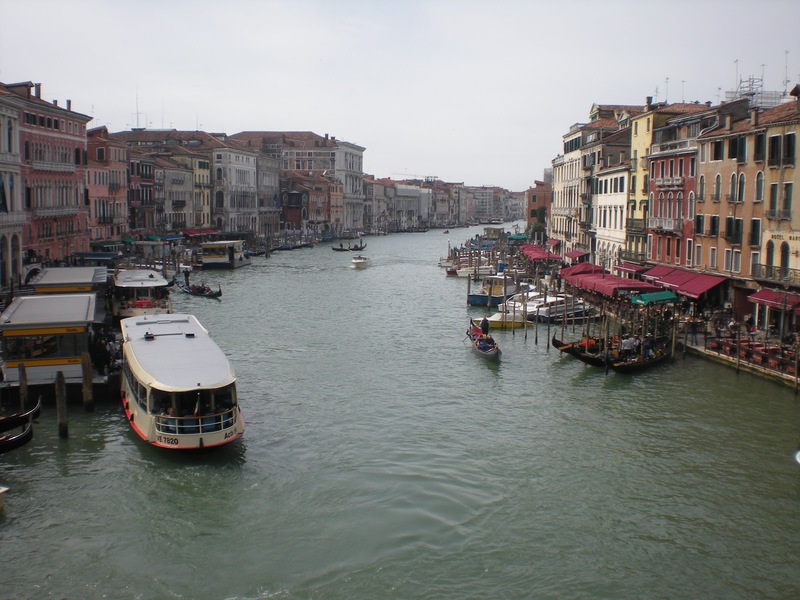 One of the most memorable images I have of this particular visit to Venezia was seeing the canal and buildings when we first arrived, coming out of the train station. Not the magnificent Rialto bridge nor stunning Piazza San Marco! I fell in love again… I hadn’t been to Venice since 2005 and suppose I was waiting for it! 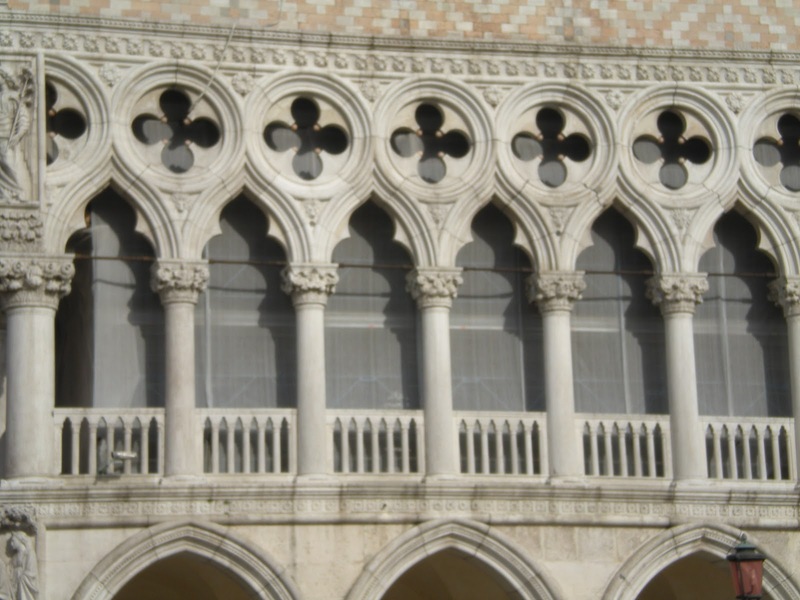 J was impressed when he saw more- more impressive buildings and the vast size of Venice, which was bigger than what he expected. 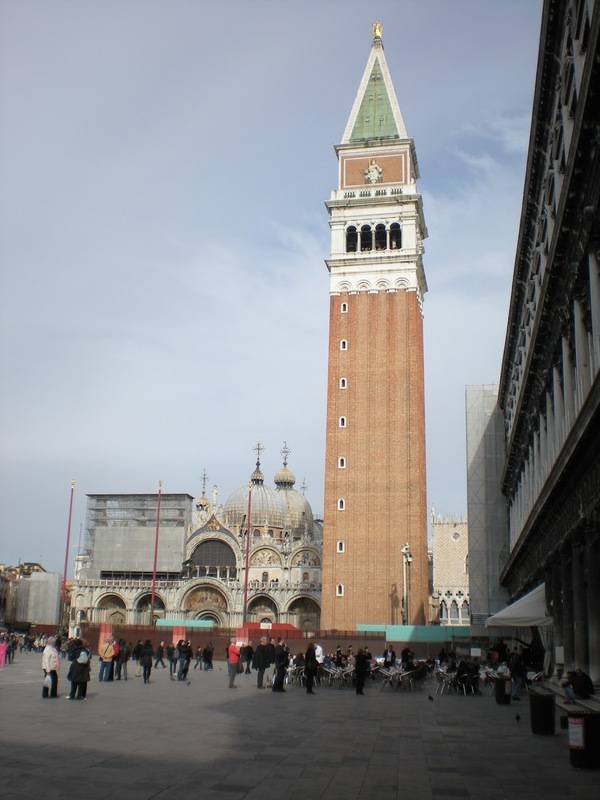 We boarded the busy vaporetto (water bus) and got off at the stop recommended by the hotel but instead of continuing to follow their directions, I made a detour so J could see Piazza San Marco. A significant portion was covered in scaffolding or blocked off, but was still stunning nonetheless. Ah, you just have to see it! Our hotel in Venice was also very nice. Hotel al Piave to be exact. The room had four single beds, two that were pushed together to form a queen-sized bed plus a big bathroom. The bathroom only had a small walled shower (again) where I found it difficult to shave my legs! After checking in, one of the first things we did was to visit Murano, but everything was closed or closing when we arrived at 6. J says that this was an excuse to visit this area again. I suppose so. I had wanted J to see a glass blowing demonstration. We did see a guy decorating an object with sticks of colored glass and a small blowtorch in Venice. We actually spotted him twice in his shop working. 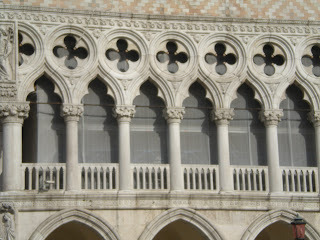 In addition to murano glass, I bought a piece of street art-- a watercolor of Piazza San Marco with the cathedral (duomo in Italian), the bell tower, the piazza half in light, half in shadow and just a bit of Doge’s Palace, showing the arches topped by my beloved quatrefoils and a figure painting the scene at an easel. I love it. Now. At the moment, this being the first stand I saw and the fact that I only liked one of her pieces when I planned on purchasing two pieces of street art at the very least, I was initially gonna pass it by. I’m glad I bought it because I did not see another outdoor vendor! These works of art were sold in stores however. Since I said “no” at first, the artist reduced the price by 5 euro, and knowing I paid more for much smaller on previous trips, I considered the new price good and changed my mind. I swear I didn’t go into this situation to haggle, I simply changed my mind! So, there you go. You can act disinterested to score a better deal. For dinner, we chose the restaurant a few doors down from our hotel. Again, we lucked out at the restaurant called “agli artisti (of/to the artists),” arriving at 8 when the Italians usually dine and still only waited five minutes to be seated. We decided to eat like Italians and order a primo piatto (“first course” generally of pasta) and a secondo piatto (of a meat) along with a separate contorno (or side of vegetable). After walking through Venice all day, I decided on hearty lasagna bolognese (simply meat lasagna) for my primo and then grilled chicken which came with a slab of polenta (like corn meal) and grilled various vegetables. J ordered cuttlefish twice. His primo of spaghetti was black! …probably dyed with its ink? But he reported that it tasted good. For dinner, his fish was white. After dinner, we went on a moonlit gondola ride. Apparently, the moon was closer to the earth and was bigger and brighter. How perfect, right? The next day was our full day in Venice. J did laundry since he truly only had a backpack of stuff at the laundromat down the block from our hotel. (Grazie Rick!) We shopped at the touristy stands near the Rialto. I stumbled across the restaurant where I dined with my Italian contact, Luigi, during study abroad around my birthday in 2005. For lunch, we dined at a table on a piazza. I ordered a pizza margherita, one whole pie with fresh tomato and mozzarella and possibly basil. J ordered chicken with those delicious grilled yellow potatoes. We ordered ½ liter of vino rosso which was served in a small glass pitcher called a carafe. I liked this one. I had a caffe “…to close the stomach.” (The Italians use coffee or a liquor like grappa as a digestive.) I spoke Italian when I could, mostly when I ordered meals, coffee and tickets. Although we liked to bypass the ticket window and use the “Fast Ticket” kiosks at train stations where you could go through the process in English. Anyway, it was a pleasure to speak it, even if I was butchering the language and was met by blank stares sometimes. When we checked into our hotel, I had the front desk guy call in a reservation for Saturday night. I choose a more normal time for us, 7, which was also the earliest possible time slot. When we arrived, they did not have our reservation, but were able to seat us nonetheless. The restaurant was called “Enoteca e Trattoria La Bitta.” It proudly does not serve fish and since I do not like seafood, I was happy with the option. (The menus are smaller when compared to the ones in the US.) 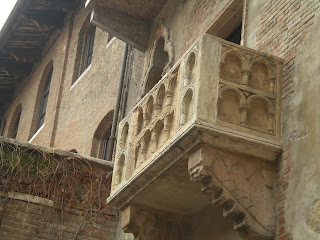 It was located in the Dorsoduro district which is a place I believe we had not wandered into yet. J loves cheese so I insisted on a cheese platter as an antipasti. The offerings were arranged from weak to strong, two of which had a pairing. I am actually not crazy about cheese, though I have come a long way with it in liking Italian cuisine. Nonetheless, I tried just a bit of each one, barely getting the strongest cheese broken open by bluish green mold down! Based on what we ordered, the waitress recommended a red wine, one with a German name because its area was once occupied by the Austrians. I loved it. I ordered beef wrapped in bacon which came with a bit of mashed potatoes and vegetables. Delizioso! For his meal, J ordered duck. We shared a slice of spice cake and one of chocolate cake for dessert. Waiting for our reservation time, we stopped at a bar nearby this restaurant. Luigi had introduced me to a local cocktail called Spritz (con Aperol) back in 2005 and I had one that night, plus half of J’s since he didn’t like it! J had the Italian beer Peroni draft. J and I ate breakfast at the hotel before checking out. I enjoyed the vaporetto ride back to the train station, as the sun finally came out after three days of it either being overcast or such a light rain that an umbrella’s not needed. I tried to not complain so much when my hair grew 50% bigger and much wavier over those three days, three days I was constantly with a guy I liked! …but who complains about their hair when you’re in awe-inspiring Italy? I mean really.... I tried my best not to complain and avoid the mirrors at every single stand and store. Anyway, it was a pleasure to see the warm-colored buildings bathed in sunshine. J was off to Munich and I was heading back to Milan for my flight making a stop in Padua, so we parted at the Santa Lucia train station, on my binario, or my train’s platform. I arrived in Padova and picked up a couple of tickets for the tram. I collected my admission tickets an hour before my reservation, and then I wandered around the city known for its university. In a single piazza, I saw a magician, a band and a mime all decked out in gold head to toe. Why weren’t these things in Verona or Venice so I could show J? On this same piazza, I ate at the cafeteria Brek, which was good, healthy and cheap. Short on time, I simply ordered spaghetti with pomodoro (tomatoes), unfortunately passing up the delicious looking grilled-to-order meat and vegetable stands. I had a one o’clock appointment to see the Scrovegni Chapel, which is painted by a famous artist named Giotto. First, the twenty-five people allowed in at a time had to wait in a glass room for fifteen minutes in order to control the humidity. 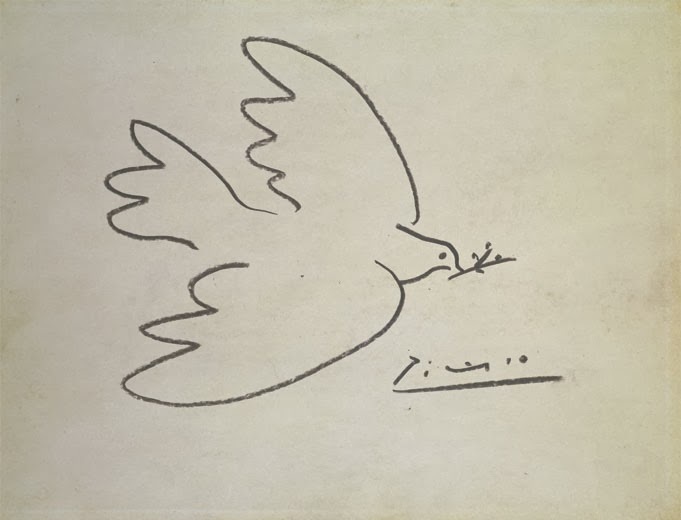 There, we watched a video about the chapel and how innovative an artist Giotto was. Apparently a guy built it to help save his father’s soul who charged high interest rates and landed in Dante’s hell. With fifteen minutes on the clock once again, we entered the space. The chapel was one long room with a starry sky painted on its barrel vault (like a tunnel’s rounded roof). Painted scenes were punctuated by smaller decorative frames with more depictions inside. Marble architectural elements were painted onto the wall to make them look real and three-dimensional. It was amazing. His talent surprised me and truly exceeded my expectations. 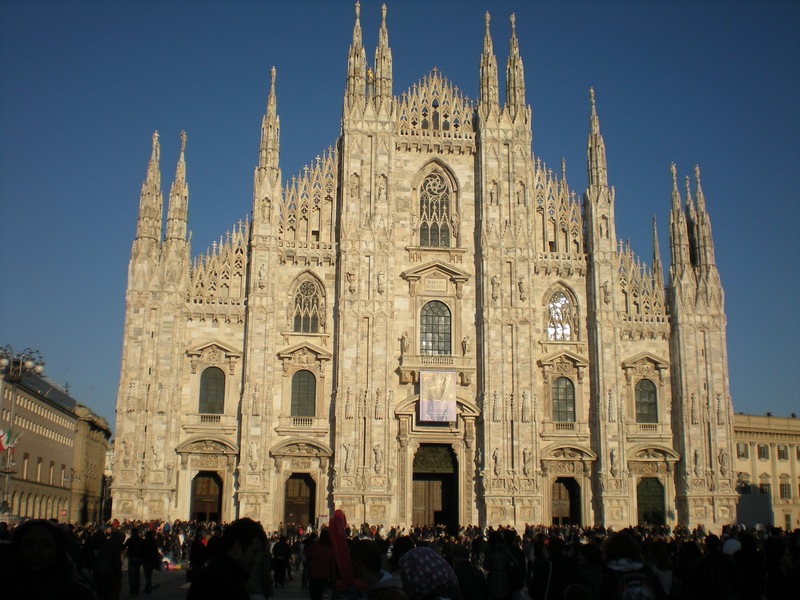 Back in Milano, I grabbed a map from the train station’s informazione (desk), and took the easy-to-navigate subway four stops to the duomo (or a city’s main cathedral, think “dome” topping a church). 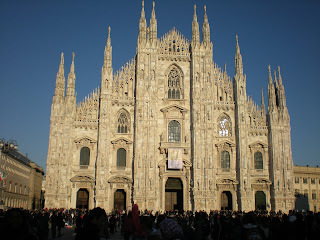 I emerged from the subway stairs in the piazza with the magnificent cathedral directly in front of me. It was golden at the time, during the late afternoon. Inside, the church was huge and dark. The floor was boldly tiled in a pattern and a latticework in the ceiling of the side aisles was quite impressive. The Galleria Vittorio Emanuele II next to the duomo was a beautiful “building,” triumphal arches for doorways. This housed an outdoor mall of fine retailers. I ordered gelato form a place next to Louis Vuitton (but not so fine places in addition as both were across from McDonald’s). I wandered around the piazza, bought postcards. I hopped back on the subway to return to the Milano Centrale to pick up my luggage and take that hour-long bus to the airport so I could then hail a taxi to my airport hotel. My hotel room was simple with its twin-sized bed. Even though the place has “restaurant” in its name, it was not open Saturdays and Sundays, so I walked a couple of blocks to the only place open. I ordered a glass of red wine from the region, currently Lombardy. Again since it was fizzy, it was not my absolute favorite. My penne pomodoro e basilico was squisito! The tomato base was creamy, I suspected that either cream or cheese had been added. And I had the bread basket all to myself! The décor was warm-colored with an Asian theme, which was different and kinda cool. The next morning I had breakfast at the hotel’s bar. I shared the shuttle bus to the airport with four other Americans, three businessmen and a wife. Had the ride been any longer than four or five minutes, I would have been the center of attention with the details of my trip, my vacation. At the airport, I finally decided on a scarf or pashmina-- a very soft pashmina in terra cotta, the color of Italian roof tiles. I had been talking about the color all trip long, and love it! I spent a bit of money just to not bring home so many euros. As a farewell, I had a final caffe, raising my little white mug in the air before bringing it to my lips, toasting Italy. I love being there… My favorite thing about Italy is what Italians value and how they live. So many of them value and cultivate relationships and just really live. I feel that being there is truly an experience in living. Especially since time and schedules aren’t so important to Italians; this allows them to be present in the moment. Think about it… They take hours off for lunch, from 1 to 4 each day. That spontaneous national holiday closed so much. Having worked in retail for so long, in America we’d be open extended hours on a holiday! This takes away from spending time with friends, family, and a significant other. Sure, Americans are plenty productive, but Italians are busy living. Italians take their time and spend it with others, over multiple courses for meals plus having to ask for your check at the end so the waitstaff does not rush you, taking an early evening walk to see and be seen. I feel that Americans could learn a thing or two from the Italians. This American included! I love that my vacation was mostly free time, without much scheduling or an endless list of sights to see, simply selecting the city I’d conquer each day. Your last paragraph sums it up beautifully. Thanks for sharing. I can tell that you enjoyed your time in bellissima Italia as much as I did! I was in these same places a few months ago and it doesn't get any better than this. I have only been home two weeks and already miss the cappuccino! Thanks for mentioning my blog,Michelle. I am enjoying reading yours!